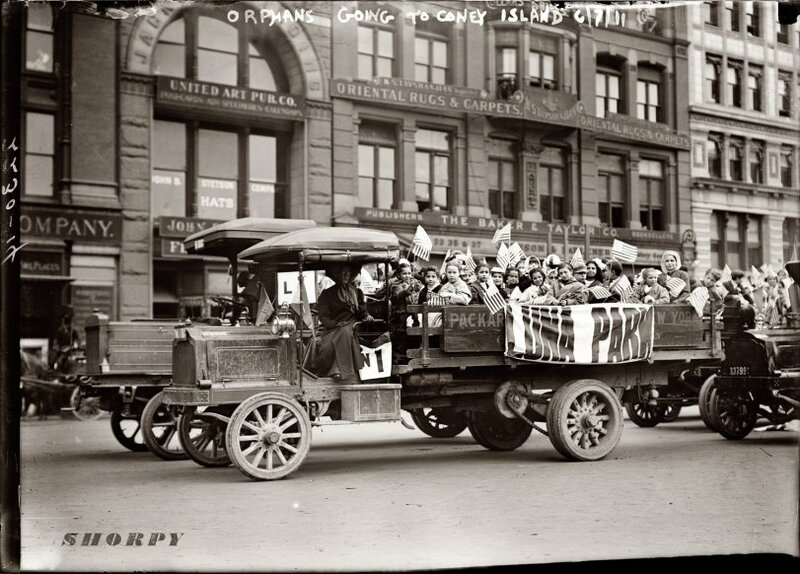 Orphans going to Coney Island (Luna Park). June 7, 1911. View full size. George Grantham Bain Collection. Submitted by Anonymous Tipster on Tue, 10/16/2007 - 11:50pm. 5,000 Youngsters from City Institutions Have Their Annual Motor Outing to Resort. 310 Volunteer Automobiles Provide the General Joy Ride -- Children Bedraggled, but Happy. If the population of New York's orphanages and child-caring institutions had been made up of adults instead of immune and undamagable youth there would be no less than 5,000 cases of adult indisposition to-day, ranging all the way from cold-in-the-head to pneumonia as a result of the seventh annual outing of the New York Orphans' Automobile Association, which took that number of orphaned children for an all-day's excursion in the pouring rain to Luna Park yesterday. As it was, however, when the youngsters motored luxuriously back to their parentless homes there wasn't a complaint or a sneeze or a headache or even a case of popcorny indigestion among them. Every one was hoarsely talkative and happy, wet as all of them were." Submitted by Anonymous Tipster on Tue, 10/16/2007 - 8:38pm. This truck has chain drive.